The Heisman House, which kicked off at Cowboy Stadium in Dallas before the Alabama-Michigan game this past weekend, looks like the front of a college fraternity, and is flanked by two 2013 Nissan Sentra compact sedans. At Cowboys Stadium, each one painted in Michigan and Alabama colors, respectively. Jon Brancheau, VP of marketing at the Nashville-based Nissan North America, tells Marketing Daily that the automaker, a Heisman sponsor since 2005, is in the game as much for the cause as for the cars. The automaker recently extended the partnership through 2016. "Most people don't know the charitable work they do; every penny goes to charitable organizations focused on underprivileged children," he says. "Partly, our goal is to help raise awareness of the work they are doing." The Heisman Trophy is the visible part of a charitable organization that funnels money to help local programs get kids outside to play, whether on youth teams or playgrounds. The problem, however, is that a lot of people don't know that, now that the athletic organization that founded it -- the Downtown Athletic club in lower Manhattan -- went bankrupt in 2002, a repercussion of the 9/11 attacks on the World Trade Center. Besides Nissan and ESPN, Wendy's and AFLAC are sponsors of the Heisman Trophy Trust that was founded after that. Rob Whalen, executive director of the trust, tells Marketing Daily that corporate partnerships are the lifeblood of the organization, and not just for getting the word out about the trophy. "On the charitable end, we don't solicit donations, so the funding comes from corporate partners and media contracts. What Nissan has been able to do with this event is heighten awareness for the trophy itself, which is enjoying an all-time high right now." He says the is goal is not to get as many partnerships as possible. "We want partners who get the value of our brand. One or two more would be fine." The Heisman House experiential program has a variety of fan events, where participants get social-media uplinks because they are given a scanable lanyard as they enter. Thus, if a fan does the field-goal kick game, their results are automatically uploaded to their Facebook page because the lanyard gets scanned before they make a kick, or do any of the other events. Sports Illustrated, for its part, is doing a constant uplink to a co-sponsored SI.com site of interviews at the House with former Heisman winners. The Heisman House venue also has the actual trophy, where people can get shots of themselves next to it, and have the photo superimposed on a Sports Illustrated cover page. Brancheau says about 15,000 people came through the Heisman House tent last year during the Michigan - Notre Dame game, and that Nissan does digital geotargeting to get people in local markets to come to the event. "We are trying to draw more people in who may not even be going to the game." As in Nissan's activation last year, this year's effort has national TV ads co-produced with ESPN's CreativeWorks, with Nissan's AOR TBWA\Chiat\Day having developed the creative concepts. The six spots, which show Heisman winners joking around in a fictive college-frat style Heisman House, air before kickoff on “ESPN Saturday Night Football” on ABC. The new spots feature 2011 Heisman winner Robert Griffin III -- who, like a fraternity pledge, gets the short end of the stick and has to do dubious tasks to please the older frat brothers. Nissan vehicles are visible when Heisman House habitués drive up or depart. "We really tried to be subtle about branding of the vehicles." The spots drive consumers online to cast a vote for the Heisman winner. Brancheau says Nissan actually has one vote -- the only organization beyond the block of Heisman winners and sports journalists with that privilege. Nissan's vote is derived from consumer input at a cross-promotional Nissan and Sports Illustrated site. 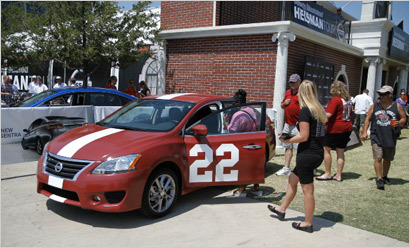 At the Heisman House venue at games, Nissan has a fairly light presence with the cars bearing the opposing team paint schemes, and the Nissan log on co-branded signage. "But," says Brancheau, "the contextual relevance is off the charts, and that's one of the great things for us; it makes all of our efforts in NFL and college football more contextually relevant." As for the future. "We've taken the idea and brought it to life, so I think we'll leverage this and keep making it bigger for the foreseeable future."